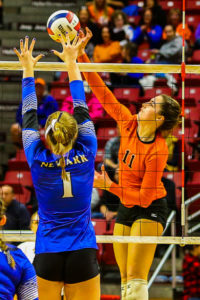 NORMAL – When Hartsburg-Emden tied the second set of Saturday’s Class 1A championship game at 23-23, Newark’s 6-foot freshman outside hitter Megan Williams was ready. 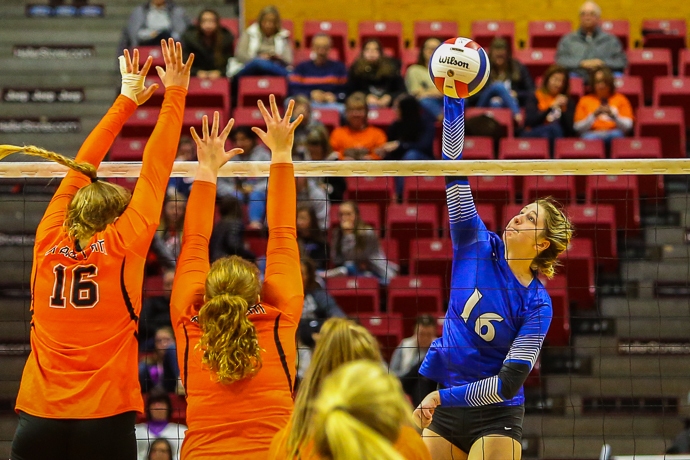 Williams tooled a kill off the Hartsburg-Emden block to put the finishing touches on the Lady Norsemen’s 25-16, 25-23 victory and first-ever state championship. Williams finished with 9 kills for Newark (40-2), which placed fourth in 2017. “These girls went out and took this match like nobody’s business,” said Newark coach Tonya Grayson. “Talk about stepping up on the biggest stage and the biggest moment. They were calm, cool, collected, all about business. Of course it helps to have the best player in Class 1A on your side. Six-foot sophomore Madi Malone led Newark with 11 kills, winning her head-to-head duel with Hartsburg-Emden’s Memphis-bound senior Anna Hayes (9 kills, 6 digs). 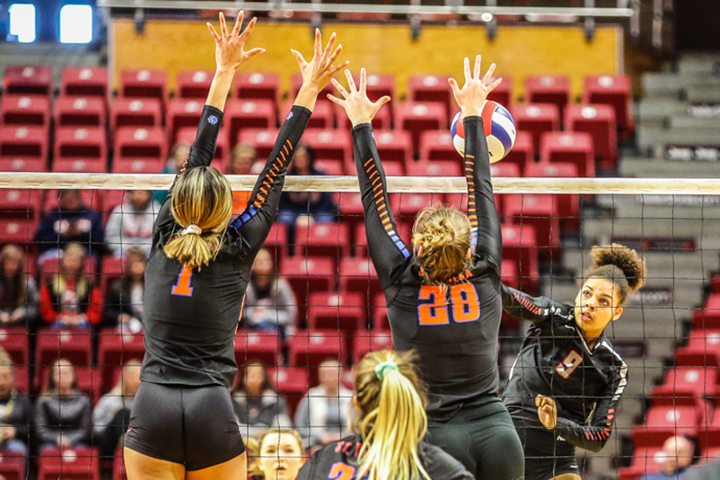 Malone closed out Game 1 with a kill, but Hayes & Company rallied from a 19-13 deficit in Game 2 and pulled even on a kill by Alaina Bradburn and back-to-back hitting errors by Newark. The Stags served short on the next point, setting the stage for Williams’ heroics. Mattie Chapman added 5 kills for Newark, which also got 25 assists from 5-5 senior setter Olivia Nelson and 17 digs from the school’s all-time dig leader, 5-4 junior Meggie Scott. Grace Beekman had 8 kills, 11 assists and 10 digs for Hartsburg-Emden (36-5), which lost an earlier match to Newark 25-12, 25-23 at the Mt. Pulaski Fall Festival. “Actually, we played horrible the first time we played, so this was a lot better,” said Hartsburg-Emden coach Jennifer Hayes. “Unfortunately, the conclusion was the same. Newark did play well. They were able to block and get hands on our offense, and they were able to run their offense a lot better than we could. Decatur St. Teresa used a 9-0 service run by 5-9 junior setter Cami Lobb to break a 9-9 tie in Game 1 then opened the second set by scoring the first 6 points to claim third place over Grayville. Five-foot-11 sophomore middle hitter Caleigh Craft led St. Teresa (39-2) with 6 kills, Valerie Nutakor added 5 kills and 3 digs, and DaeLin Switzer and Lexie Huck (7 assists) each had 4 kills. Lobb added 17 assists and Abby Robinson had 17 digs. Grayville (27-10), the second smallest school in the state finals field with 86 students, got 7 kills and 5 digs from 5-7 junior Sidney Foster, 4 kills and 6 digs from Macy Knight and 1 kill, 6 assists and 4 digs from senior Carsyn Robinson.